ASHEVILLE -- Some Asheville police officers, who responded to a street complaint in the Oakley area on Saturday, are getting some positive attention after they joined in on a 4th of July party. Resident Katlen Joyce Smith told WLOS that her neighborhood has over 20 kids in a four block radius. So to have a litte fun, the neighborhood gets together for a 4th of July block party every year. This year, the neighborhood adults built a giant slide for young and old to enjoy. Apparently, not all the neighbors were excited about the street being blocked off and contacted authorities. The responding officers, after stressing safety and addressing the neighbors concerns, ended up joining in on the fun! 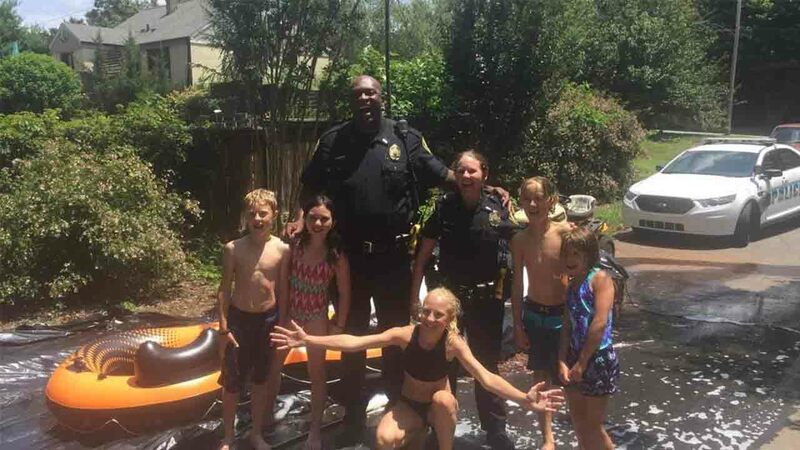 The police department posted a video of officers tubing down the slide on their Facebook page saying, "When it's hot...and you're responding to a street complaint...and there's a fun way to cool down...you take advantage of a giant slip and slide. The officers told the residents that the slide was far enough over to the side that vehicles could safely get past. No citations were issued.